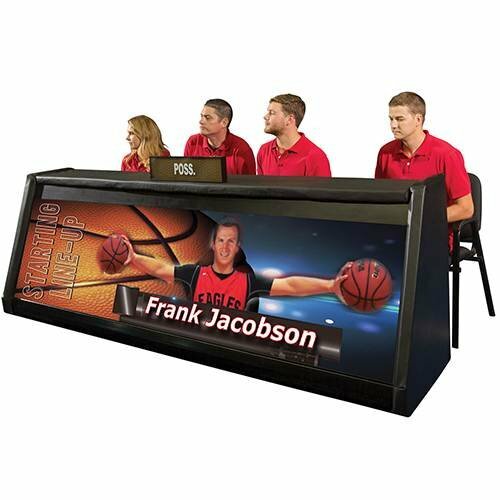 Our digital scorers table enable you to cash in on advertising dollars to make improvements to your gymnasium and school in general. Invest today and reap the regards of ad dollars tomorrow! Officials can properly watch and preside over basketball games and other sporting events with help from this Digital Scorer's Table. This high-grade vinyl-covered, freestanding table with lockable swivel casters can be positioned just where you need it on the sideline for optimal visibility. Thanks to the included personalized content package preloaded on the laptop and the high-definition display, spectators will be able to see the sponsored content in crystal-clear resolution, helping generate revenue for your sports program.